VPS10 of Saccharomyces cerevisiae encodes a type I transmembrane receptor protein required for the sorting of the soluble vacuolar hydrolase carboxypeptidase Y (CPY). To characterize the essential structural features and intercompartmental transport itinerary of the CPY receptor, we have constructed mutant forms of Vps10p that alter the carboxyterminal cytoplasmic tail of the protein. In addition, we have analyzed the effect these mutations as well as mutations in several VPS genes have on the function, stability, and localization of Vps10p. Although wild-type Vps10p is very stable over a 3-h chase period, overproduction of Vps10p results in PEP4-dependent degradation of the receptor. Immunofluorescence studies indicate that overexpressed receptor is delivered to the vacuole. A mutant form of Vps10p, in which 157 residues of the 164-residue cytoplasmic tail domain have been deleted, missorts CPY and is degraded rapidly. 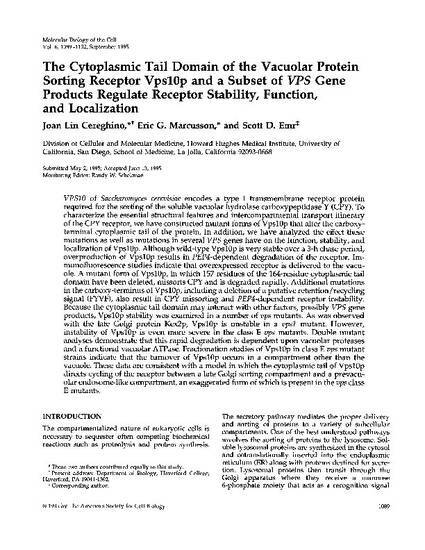 Additional mutations in the carboxy-terminus of Vps10p, including a deletion of a putative retention/recycling signal (FYVF), also result in CPY missorting and PEP4-dependent receptor instability. Because the cytoplasmic tail domain may interact with other factors, possibly VPS gene products, Vps10p stability was examined in a number of vps mutants. As was observed with the late Golgi protein Kex2p, Vps10p is unstable in a vps1 mutant. However, instability of Vps10p is even more severe in the class E vps mutants. Double mutant analyses demonstrate that this rapid degradation is dependent upon vacuolar proteases and a functional vacuolar ATPase. Fractionation studies of Vps10p in class E vps mutant strains indicate that the turnover of Vps10p occurs in a compartment other than the vacuole. These data are consistent with a model in which the cytoplasmic tail of Vps10p directs cycling of the receptor between a late Golgi sorting compartment and a prevacuolar endosome-like compartment, an exaggerated form of which is present in the vps class E mutants. Publisher's version located here on the journal website.